The NFL's Aaron Hernandez guns for jerseys program got me thinking about the jersey phenomenon. Fans do love to wear their official jerseys to the game, but of course most of us don't the ways and means to replace that $120 shirt every time a player gets cut so we just keep wearing that jersey of the 1st round bust. We covered etiquette here but because my brain tends to lean towards the wildly inappropriate, I started thinking about the worst possible jersey for each team. The one that you have to replace because wearing it will get you beaten up by your fellow fans. I decided to do this off of the top of my head, no google, no pfr. Partly because I'll forget someone really obvious or screw up a number so it encourages participation and gives you, the loyal FP viewer, the opportunity to call me an idiot. But mostly it's just because I'm lazy. Eagles - Mike Mamula ?? Packers - Tony Mandrich ?? Panthers - Rae Carruth (89? ), Tim Biakabatuka ?? Saints - Billy Joe Hobert ?? I couldn't think of anyone for the Broncos? They've had bad draft picks (Jarvis Moss comes to mind) but no one I can think of that's worthy of this list. Billy Joe Hobert for the Saints is pretty weak. A little google hindsight shows that I probably should have gone with Jonathan Sullivan. After guessing 89 for Carruth, I put in the pic of the guy wearing the Carruth 86 jersey. According to PFR Carruth wore 84 and 89 but never 86. I'd nominate Palmer for the Bengals. People either don't wear them anymore or have taped "Quitter" on the back instead. Pretty sure Tshimunga Biakabatuka was #31. I think Hobert was #11. I nominate Bobby Humphrey (23?) for the Broncos. William Green (31) for the Browns, Courtney Brown (92) for the Browns has a nice touch of funny with it. A crappy Brown with a brown jersey who played for the Browns? Awesome. Tommy Vardell (42?) is good, too. And, this article is up my alley. So much so that I am pissed I didn't think of it after my "There's Always 2013" series. I plan to eventually claim that I wrote it once it leaves the front page. What about Heath Shuler for the Saints? And Kerry Collins for them, too. Was Mandarich #79? I think so. I'd like to nominate Huey Richardson's #90 for the Steelers. Eugene Robinson might be a contender for the Falcons jersey, despite all his good works. Arguably cost them a Super Bowl. Can't top Haynesworth for the Redskins. I'll be pedantic and point out that Rob Johnson wore 11. I remember seeing guys showing up with their Johnson shorts with tape over the name reading "Bledsoe." But 11 is also Norwood's number, therefore, 11 is a winner. On special occasions I still wear my Browns #80 (Andre Rison) shirt. It's a winner. Can we extend this to baseball so I can include a Derek Bell Pirates jersey on the list? Funny that Titans fans probably burned their Pacman jerseys, but most Bengals fans would be proud to own one. I'm not sure anybody would have one, but Lewis Billups is another infamous name in Bengals history, though his really bad troubles came after he left the team. If Dan Reeves were in my fantasy league, we'd force him to wear a Tommy Maddox Broncos jersey to every draft. For the Lions, Mike Williams, Tatum Bell, or Rudi Johnson would all work. Better yet, lets just create a #55 Matt Millen Honalulu blue jersey and call it a day. I had to limit my Bengals to the top 2. Easily could have Klingler and Akili Smith as well. In the interest of full disclosure, there is a David Klingler jersey somewhere in the back of my closet. Down here, Dan Reeves is remembered fondly (for his coaching, not his drafting.) I still feel Blank fired him prematurely. He was the only guy who had a handle on Michael Vick. But Vick got hurt and Reeves got fired. For the Bears, pretty much pick a QB and you'll be good; Cade McNown was probably the most heartbreaking and deserving of this list. I should probably ask some of my college buddies, but my sense would be that, other than trumpet's commemorative Matt Millen jersey, the worst jersey a Lions fan could have might be Joey Harrington. It's not that he was the worst pick the Lions ever made, but that he was the savior, and it was before everyone realized that Matt Millen is less qualified than most 5 year olds at being an NFL GM. Cardinals- May not be fresh, but how could anyone justify a Timm Rosenbach (3) jersey? 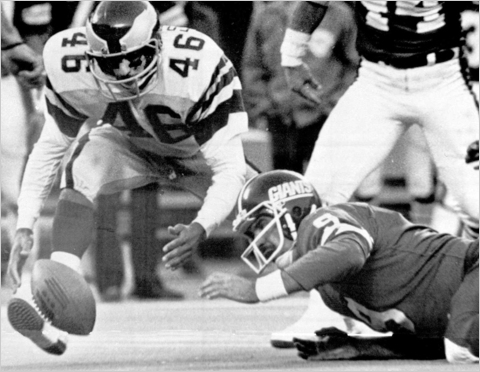 If one fumble dooms a jersey, then Joe Pisarcik is the man for the Giants. I agree with wax that Earnest Byner is probably ok, but there are some good ones on here that I missed. Particularly TO, Blair Thomas, Bosworth and Rosenbach. I considered Andre Ware for the Lions but like the Bengals their plate is already pretty full. Heath Shuler is a 3-fer, Redskins, Saints and Congress (I have absolutely no idea what kind of politician he is/was or even what party he's in, just can't resist a good joke). Byner is certainly harsh, as is Anderson. But considering how that was the Browns and Vikings best chances at a Super Bowl, and each player represents the signature negative moment of each team's disappointing past 40+ years, I think they should be included. It's one thing to support Byner or Anderson (or Norwood for that matter). It's an entirely different thing to tote their jersey. Others may disagree, but I'm standing behind both selections. We should have had an all-time bad jersey draft. That would have been epic. Still taking a Pirates Derek Bell jersey with my first pick. 1. A Mets Tsuyoshi Shinjo jersey. 2. A Mets 1999 Bobby Bonilla jersey. 3. A Bears #12 Jonathan Quinn jersey. I want a Bengals Barry Foster jersey. I don't think Earnest Byner should be included. People complain about 'The Fumble,' not about him. And say what you will about Tim Couch, the dude was the quarterback of a team that got to the playoffs. He wasn't great, statistically or physically, and he clearly wasn't a #1 pick, but he wasn't the disaster, say, Brady Quinn was. And no one hates him the way they do, say, Braylon Edwards. And then there's Courtney Brown, Gerard Warren, and William Green. Lord, have mercy. How did we win nine games in 2002? And we should have won more. That was the season they lost to Kansas City by a point because of the infamous 'helmet toss' by Dwayne Rudd. And they lost a game to Pittsburgh (I believe this was 2002) because the Browns blocked the Steelers' game-winning kick on third down, but it didn't cross the line of scrimmage (so they picked up and converted on fourth). Or the playoff game where they blew the three-score, second-half lead to Tommy ! @#$^&% Maddox. Anyway, Tim Couch is more complicated than it looks, that's all I'm saying.